Officially known as Burbank Bob Hope Airport, this is the original commercial airport serving Hollywood and Los Angeles. It first opened in 1928, funded by a holding company formed between Boeing and United Air Lines. 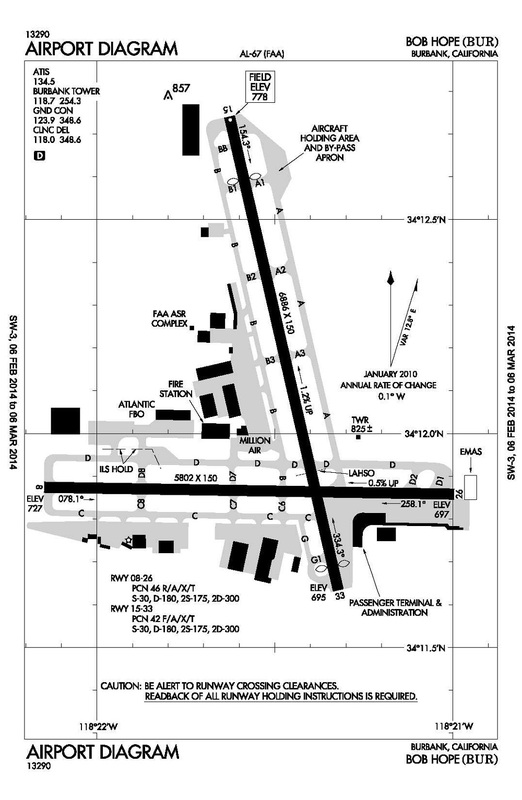 The early runways provided a 5-inch thick mixture of sand and oil for landings and takeoffs. The facility was said to be the first multi-million dollar airport in the U.S.
Burbank’s status as the leading airport in the L.A. Basin declined after WWII, with the rise of LAX. Burbank continued to provide scheduled passenger service, and has seen increased passenger counts with the rise of jets in the 1960’s, airline deregulation in 1978, and the arrival of carriers like Southwest and JetBlue. However, as shown by the ATADS data below, total airport operations have declined by 43% since 1990. Also, in the last few years, a larger decline has been masked by a rapid increase in local pattern traffic operations — which translates to increased noise complaints. Today’s airport sits on 610-acres, and is home base to 88 aircraft (including 50 jets and 3 helicopters). An FAA air traffic control tower is open 24/7 and manages roughly 366 operations per day. The airport is surrounded by dense development, and there is a long history of noise impact upon residents. This history has produced grandfathered airport design elements and airport size restrictions. …A Cessna flying a closed pattern passed over a Southwest Boeing 737 that had just landed on a crossing runway. The controller error was noticed by the Clearance Delivery specialist in the tower, as it occurred. NTSB investigated, and confirmed the close proximity of the two aircraft using airport video shots.